A. 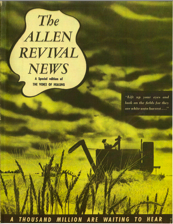 A. Allen was a famous revivalist of the 1950’s – 1960’s. 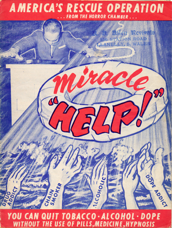 His monthly ‘Miracle Magazine’ had an international and bi-lingual circulation of 340,000 by 1969. His ministry was known for countless creative miracles, signs, wonders, deliverance and healing. He also influentially helped pioneer the move to break segregation of blacks and whites in America. PDF Digital download now available. Special Edition Magazine published about A. 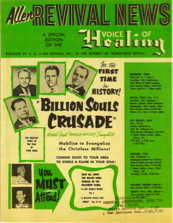 A. Allen Ministry for Voice of Healing circulation. A. 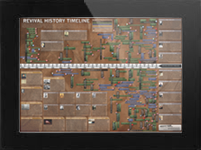 A. Allen ministry as an evangelistic outreach tool. The owner of this site is the great-granddaughter of the late A. 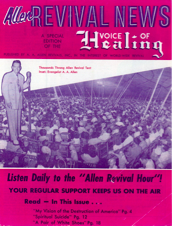 A. Allen who was a famous “tent preacher” of the 1950′s – 1960′s. If it hadn’t been for a few faithful historians (plus dad and great-grandma Lexie! ), it would have been near impossible to collect and preserve the teachings of A. A. Allen to learn from today. While some artifacts are yet to be found and many need still to be digitized, most are being preserved so that not just a few select can learn from them. In time, we’ll share more with you as we’re able. A. A. Allen is certainly only a representation of so much which God has done through faithful leaders of revival. If you feel you have materials, such as books, magazines, tracts, etc by or about A. A. Allen, please contact us about them. We would love to safely digitize your valuable historical items before they deteriorate or are lost or damaged and then give them back to you plus digital editions. We could then make them available to a new generation to encourage their faith. Only heaven may tell what an impact your help could make.